We conclude our weekend visit to Castle Frankenstein with a view of the site as it appears today: Castle ruins against the sky, an old church spire and a beautiful crenellated tunnel entrance. 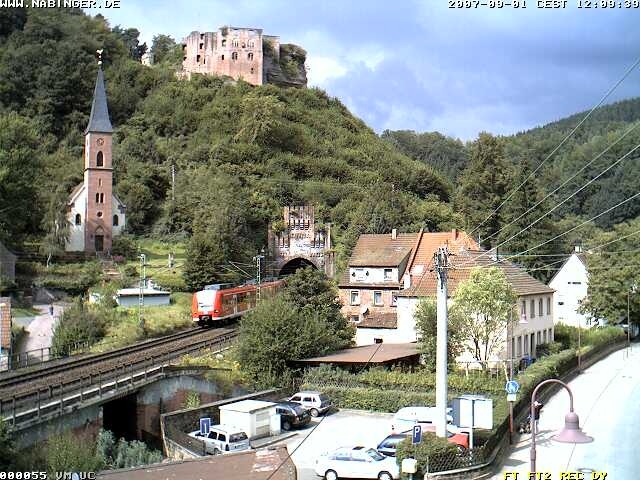 UPDATE: The Burg Frankenstein live webcam is back online. I captured the above picture with the red Railjet train zooming out of the tunnel a few days ago. Perhaps one day, we'll catch Fritz releasing the kites!